Updated 11/20/18 to include our review of Logitech’s G502 Hero gaming mouse, an update to the much-loved G502 Proteus Core and our new favorite general-purpose gaming mouse. 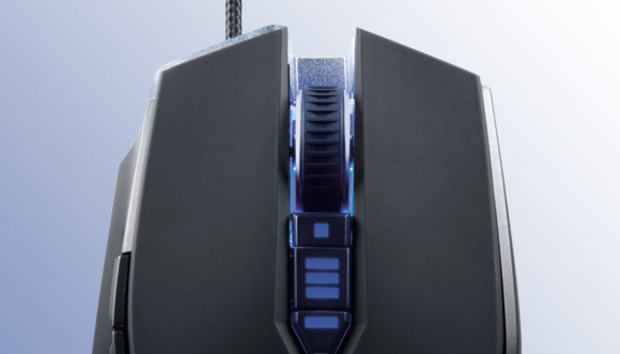 See the bottom of this article for all of our gaming mice reviews. The latest overhaul is 2018’s G502 Hero ($80 on Amazon), so named for the sensor inside. Logitech’s replaced the beloved PWM3366 with its new flagship Hero sensor, designed to mimic the top-tier performance of its predecessor while being slightly more power efficient. That latter point doesn’t matter much here because...well, it’s a wired mouse. Hero is excellent though, seemingly just as precise as its forbear, so there’s really no downside in buying the latest version—especially since the G502 Hero also adds Omron switches, rated for 50 million clicks (as opposed to 20 million on the former model). The slimmer cable is a welcome improvement as well, less prone to kinks or gathering dust. Button count: You’ll pretty much never find a three-button gaming mouse. Even the budget-friendly devices we’ve tested have five to 10 buttons. The award for “Most Buttons” still goes to the Roccat Tyon, with 14. Sensor: Dots per inch, or dpi, is a measure of how many pixels the mouse moves on-screen per each inch of desk you move it across. Some people prefer to make large, sweeping motions with a lot of precision, necessitating a low dpi. Others want fast, jerky motions that start and stop on a dime—high dpi. The latter group will want to pay particular attention to each mouse’s limit. At this point, the dpi arms race has become largely meaningless. Manufacturers push numbers that are so high as to be impractical for most people’s day-to-day use. Is that 16,000-dpi mouse actually more useful to you than the 12,000-dpi mouse? Probably not. Shape: There are three main categories here, too: right-handed, left-handed, and ambidextrous. We’ve looked at right-handed and ambidextrous mice because our testers here are right-handed. Some right-handed mice (such as the DeathAdder) have left-handed variants, but these are a rarity. Most southpaws will probably end up with an ambidextrous mouse, like the G-Skill Ripjaw MX780 or the Razer Diamondback. Let’s get to it. We’ll keep updating this story with new products, too, so let us know if we’ve missed a personal favorite—we’ll try to get it in for testing.